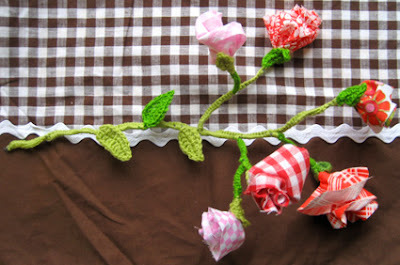 flowers | Hello Craft Lovers! I lost my dad the 5th of March 2010. I wanted to make a funeral decoration myself. I was his only child and I got my crafting skills from him. 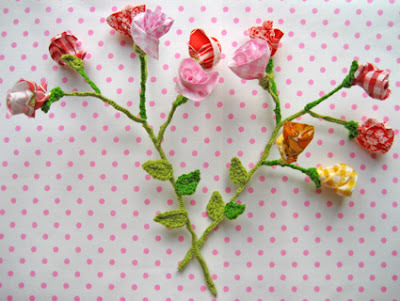 I made this bouquet of fabric Roses with crocheted leaves and long winding Ivy. 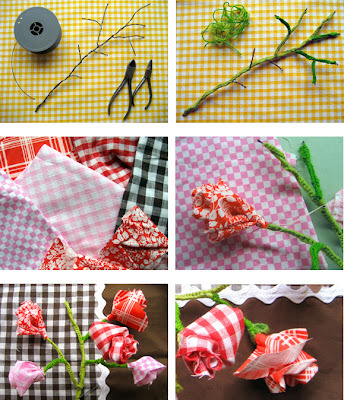 I’m working on a tutorial with patterns and all the pieces :) If you want to make one like it yourself. No more gLoomy days! It’s spring! Have been thinking hard about what to do with the loom flower project I wanted to start. Sketching about it. Nothing felt right. Until I did this sketch. This is a typical Inger project isn’t it? Fun to make but makes no sense at all. I love Daisies. They are so sweet looking. Had a couple of rolls of plastic ribbon (don’t know the word for this product in english). Made a test and it was so much fun! Ended up with a little pile of plastic Daisies. This makes me SOOO happy!!! Look at this cap! I love it. Have to buy a green swimsuit :-D.
My old friend ”Mosquito” had her big birthdaybash yesterday. Made her a necklace out of vintage jewelry-parts from my stash. It became a bit ‘Hawaii in the 50′s’….I long for the summer..
My friends will recognize these brooches which I have been selling for a couple of years now. This time I changed them a little with an orange ball from a ball-ribbon and embroided yarn knots. I’m attending one of my multitalented friends book releaseparty tonight. 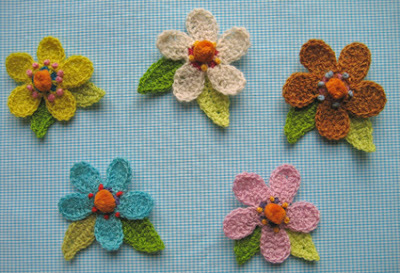 Made some homemade crocheted and sewed flowers. It’s nice they will keep for a very long time!